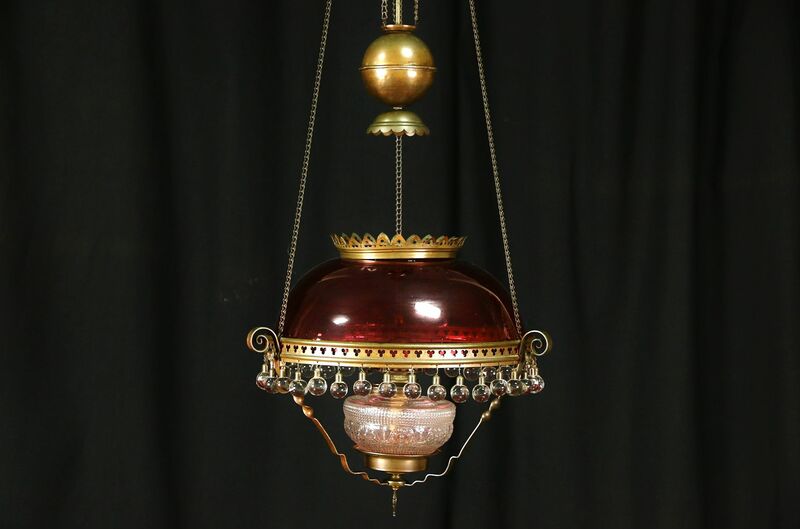 A charming Victorian 1880 era hanging lamp light fixture is all original with a cranberry glass shade. Genuine cranberry glass like this has a gold cast, it is made using genuine gold. There is a kerosene burner that has never been electrified, conversion to an electric socket is not difficult. Solid brass mounts including the "smoke bell" have nice old patina on this American made antique fixture. The 14" diameter hand made shade is undamaged, bubbles and irregularities show that it was blown. Spherical glass ball prisms are rare. The pulley system works with the ball counterweight to raise and lower the shade for lighting and refilling. The fixture adjusts from 45" to 58" tall including the chain as shown. Packing and shipping is $65 in the US.